Sufermee is a quality product manufacturing company, with more than 20 years of manufacturing experience. The goal is to provide you and your family with the perfect products and shopping experiences. 100% Money Back Guaranteec: Not satisfied with the product, unconditional refund. Design: Vintage Hair Clips, 4 Different pattern include rhombic flower, oval flower, feather, butterfly, special designed hair accessories. Colors: 6 different colors Included as shown in the photo, each color 1 pieces. size: rhombic flower Clips 1.6", oval flower Clips 1.5", feather Clips 2.2", butterfly Clips 1.5". Package includes: 24 Pcs Vintage Hair Clips, 4 Different pattern include rhombic flower, oval flower, feather, butterfly, each pattern 6 colors as show in photos. 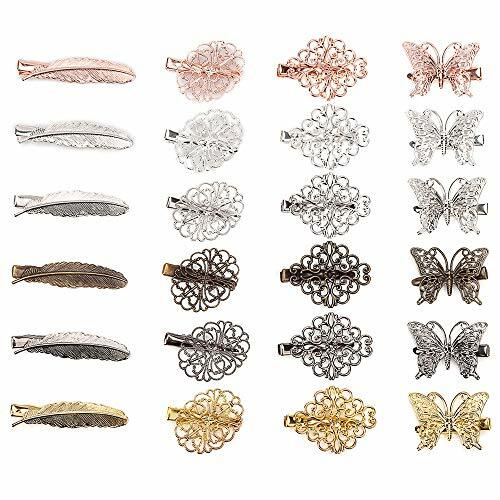 Design & material: Vintage Hair Clips, Butterfly ,Leaf ,Flower Shape Hair barrettes with alligator clips, special designed hair accessories; Made from alloy, Shiny and Durable. Size & color: rhombic flower Clips 1.6", oval flower Clips 1.5", feather Clips 2.2", butterfly Clips 1.5"; Silver, Gold, Bronze, Bright White, Bright Black, Rose Gold. Easy to use and hold your hair very well, 4 patterns and 6 colors to meet your different needs, wearing it makes you more attractive. Suitable match with any apparel for different occasions such wedding party,costume party,cosplay,meeting and for daily life;Great use for any different hairstyles you have, Perfect gift hair accessories for girls and women. If you have any questions about this product by Sufermee, contact us by completing and submitting the form below. If you are looking for a specif part number, please include it with your message.